After my afternoon at the Food Forest, I drove to my accommodation to check in and have a little rest. 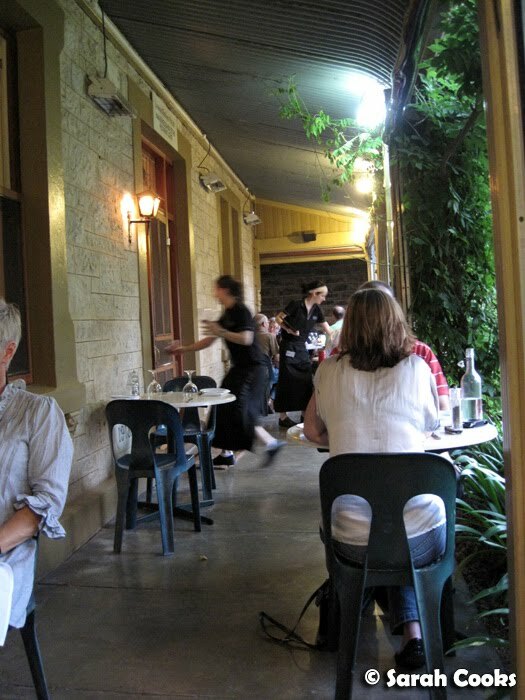 I couldn't rest too long, however, as I was about to be picked up by Jaci from Tourism Barossa and taken to dinner! 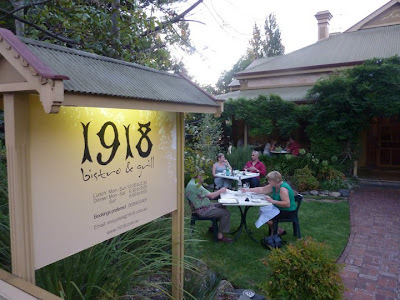 Located on the main street of Tanunda, 1918 was once the private home of Mayor Wallent, but is now a cosy little bistro serving modern Australian food. We were seated on the veranda - great spot to enjoy a balmy evening! (Although I did get a couple of mozzie bites - gotta remember the Aeroguard for next time!) There were tables on the lawn as well, and I'm told that in winter they have a roaring fire going inside. Joining us for dinner was the lovely and bubbly Reneé from Jacob's Creek, who'd brought a couple of bottles of wine, including a very delicious 2005 Shiraz Cabernet, which I must keep in mind for the next time I'm in the bottle shop. Mmm... fluffy crusty bread. I later learnt that the bread is baked down the road at the Apex Bakery (you may remember from my itinerary that I visited Apex later that week!) The story goes that 1918 asked Apex to create a bread for them, which subsequently became so popular that Apex now stock it as a standard item, called, unsurprisingly, the 1918. 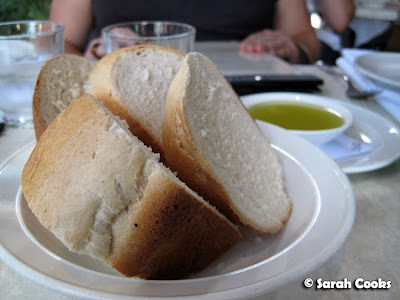 I'll write more about it when I write up the Apex bakery, but suffice to say, it's good bread and well worth picking up a loaf if you are in town! Each of us went for the 2-entrée route, which is a great idea if you are trying to reduce calorie intake, or like me, trying to save room for dessert! I went for the soup special: soft white cabbage in a rich broth, with baby corn, spinach and slices of lamb sausage. Very similar to what I'd call a "Saturday afternoon soup" back in Germany - comforting and delicious. Jaci and Reneé each ordered the seared king prawns. 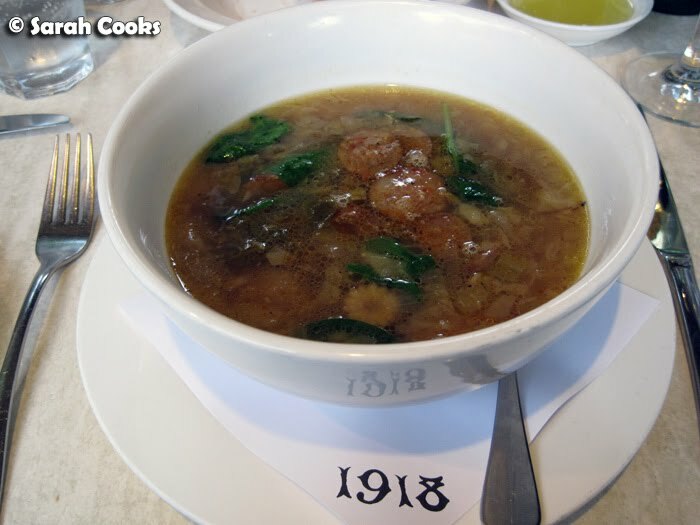 In contrast to my comforting soup, this was a fresh and lively dish. 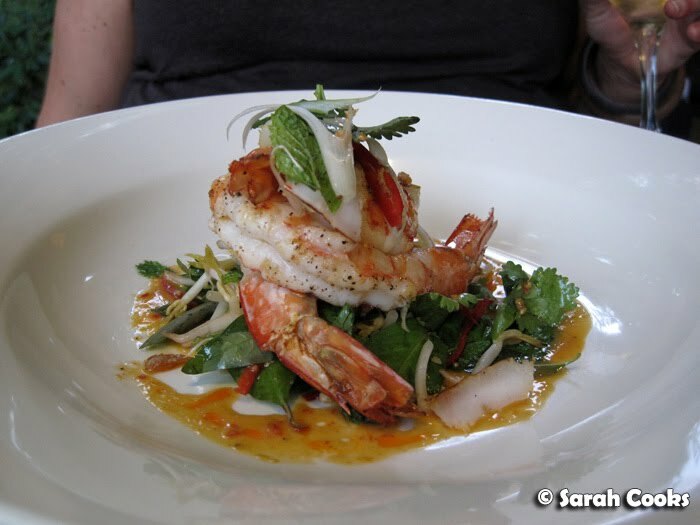 Underneath the big, juicy prawns was a refreshing herb salad of fresh coconut, coriander, mint, basil, chillies and bean shoots. As an aside, I love this type of food - great tasting and diet-friendly, without the need for any modifications. (I made some similar dishes here). And in complete contrast to what I just wrote, (well, I was on holiday after all! 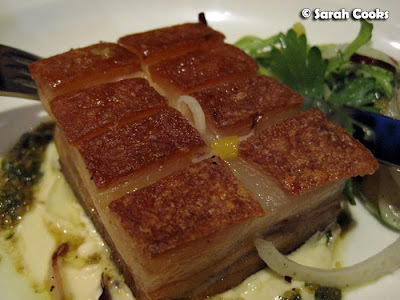 ), both Jaci and I had the pork belly for our 2nd course. I'm not normally a fan of citrus in salads, or indeed fennel, but I thought the salad matched the pork perfectly, cutting through the oiliness and preventing it from feeling too heavy. 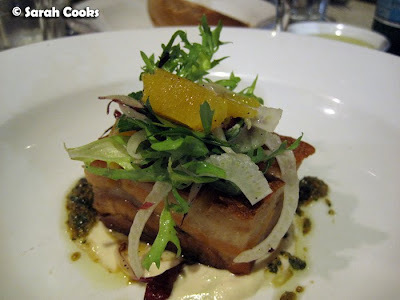 Even with the fab pork, I was really envious of Reneé's 2nd course. Check out those slabs of haloumi! 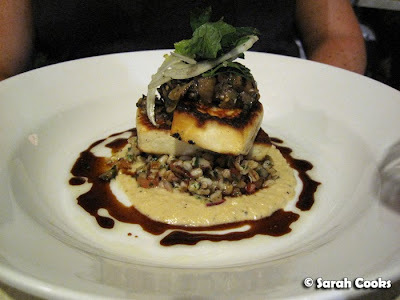 Haloumi, hommus and eggplant are 3 of my favourite foods. I tried a bit from Reneé's plate, and it was just as good as it looked. We ordered 3 desserts between us to share. First up, we have the dessert special of the evening: roasted peaches, peach ice-cream and a little pastry hat with yet more peaches. 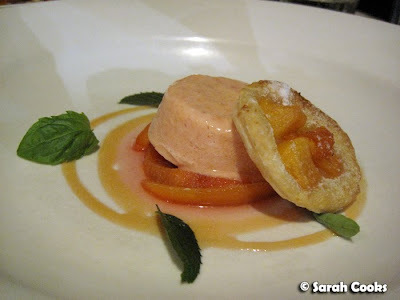 Peaches are in season at the moment, and it was lovely to try a dessert that made the most of the local bounty. Being a Melbourne girl, you know I just saw "salted caramel" and said: "Yes please!" The chocolate torte was rather like a dense brownie, sitting in a pool of salted caramel. 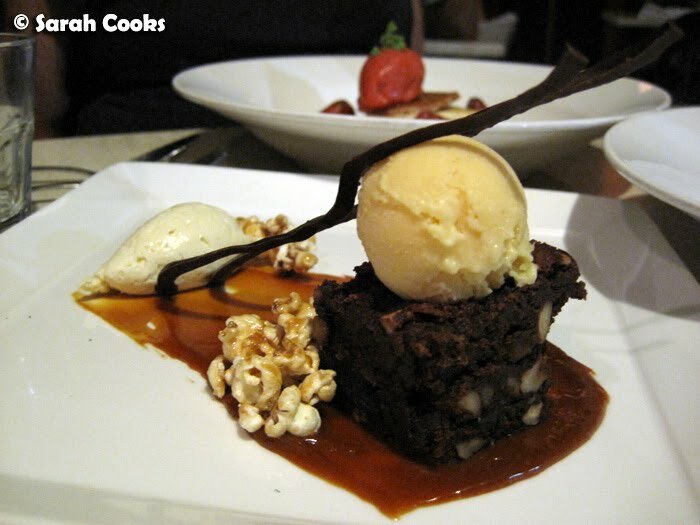 Both the popcorn and the popcorn ice-cream were great, but I thought the hazelnut cream was the standout element of the dessert. However, the best dessert was definitely the white chocolate parfait. 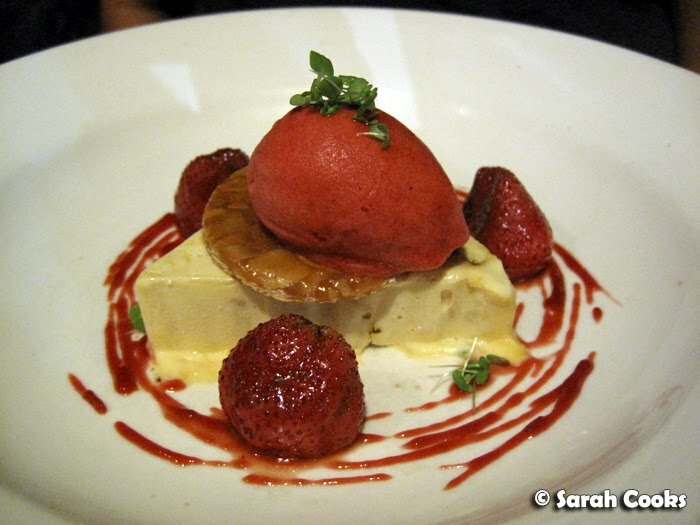 The parfait was velvety soft and creamy, and I loved the different strawberry flavours - roasted whole strawberries, a strawberry sauce, and an incredibly pure-tasting strawberry sorbet. A little almond tuile provided a welcome crunch. 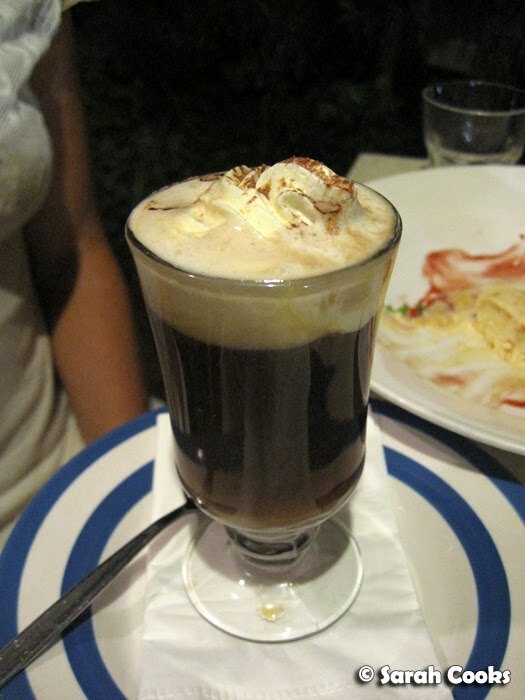 A little Irish coffee to round off the night, and that was the meal! 1918 was a wonderful introduction to the Barossa: friendly service, delightful atmosphere and fantastic food. If there had been more time on the trip, I definitely would have liked to come back and try some more! From my conversations with people I met on the trip, many locals visit 1918 regularly, and I can definitely see why. Sarah dined at 1918 as a guest of Tourism Barossa, as part of the prize for winning the Barossa's Table competition. Ooh what a feast ! I love the look of that torte too. If it was dense and brownie-ish then I would have loved it. Was going to comment on something individually but all the dishes look SO delicious. Especially every single one of them ;) You lucky gal! I would have tried to have had 2 entrees too so I could save room for those desserts! yum.